The Wire Road, which ran through Taylor County, was named for the telegraph wire that stretched along it. The road was part of the stage highway from Richmond to New Orleans. 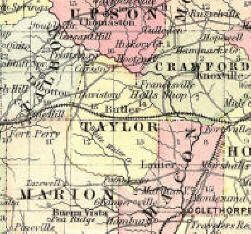 Points of interest in Taylor County include: Beechwood Farm, the home of Confederate General John B. Gordon; and the site of Fort Lawrence, which was established by Colonel Benjamin Hawkins, for whom Hawkinsville was named. Be sure to bookmark this site and visit often. This may be a new address but we are not new to Taylor County. Millie Stewart and I are your County Coordinators and authorities on Taylor county. We will start with the Cemeteries and then move along to much more data. If you are interested in helping the site grow send your information to Millie Stewart. Harry S. Truman said the BUCK stops here. Tired of links all over the web. Well the links stop here. We promise your material will never be sent to other sites and we will always add your contributions to Taylor county right here for you to research. Send your information to Margie or Millie. For your enjoyment the song is SEND IN THE CLOWNS. Clerk of Superior Court has Court Records from 1852 and Land Records from 1852. Webmaster Margie Daniels use the link and add the email address shown below.